American hickory or hornbeam sticks with YOUR own logo! Angel Drums, hand made snare drums of the top class! You find here high quality drumsticks from hornbeam (european hardwood) and american hickory. The sticks was made from drummer for drummer. 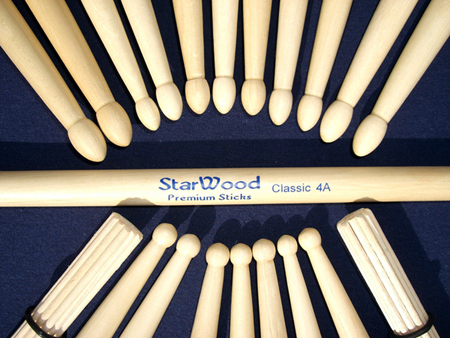 30 years experience, it is capital for you too, also order "your" StarWood drum sticks - now! Shipping in Germany 5,- euros, EU-countries 12,- euros. From 59,- Euro value of ware is the shipping free in Germany. Shipping WORLDWIDE please ask for the price! SIZE OF YOUR LOGO up to 150 mm length!